A Gartner Research survey shows that while companies often use a variety of Office 365 elements, only two – email and the Office apps – provide real value. Although enterprise subscribers to Office 365 typically use a large number of the in-the-cloud-and-on-premises suite's components, only two – email and the Office applications – provide significant value, a recently-released survey showed. The disconnect between usage and value was portrayed by research firm Gartner, which in mid-2017 polled more than 160 IT professionals to collect opinions on Office 365 in the enterprise. "There's a baseline of value to switching to the cloud, especially if things were expensive to manage [on premises]," said Craig Roth, a Gartner research vice president and the author of a report capitalizing on the survey. "But the real value comes when you start changing your work processes to take advantage [of Office 365] to its full extent." 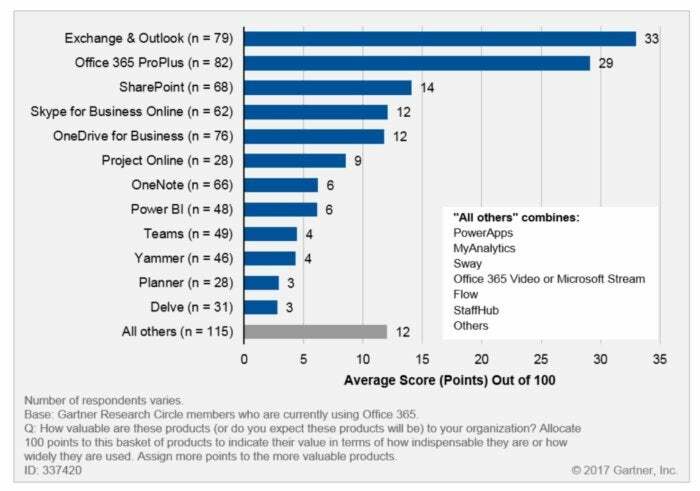 In his report, How to Work With (or Compete Against) Microsoft Office 365, Roth reported that companies were widely using more than just the Office ProPlus applications - Word, Excel, PowerPoint and the like - and the Exchange Online-Outlook combination. According to the survey results, six of 18 identified Office 365 elements were used by more than half of the respondents' companies, while another three were being used by more than 45% of the represented firms. The top two, at 88% and 82% were, not surprisingly, Office ProPlus, the locally-stored applications, and Exchange Online-Outlook, respectively. Following that pair, three - OneDrive for Business, SharePoint and OneNote - posted usage numbers in the 70s, while Skype for Business Online garnered 68%. The fall-off from there was substantial: Teams (49%), Power BI (47%) and Yammer (46%). Then usage plunged again, falling from Yammer to the likes of Project Online (30%) and Delve (30%) before dipping into infrequent territory. The numbers showed that Microsoft has largely succeeded in convincing customers to use more of the product than just the Office applications and email, Roth said. "I think Microsoft has shifted its focus a bit. A couple of years ago it was about adding technologies," Roth said, citing Teams as an example. "Recently, it's been a lot more about adoption and trying to get the suite used more often." Yet usage, in whatever form, doesn't equate to value. That was one of the big take-aways from the poll, which unlike past iterations, asked respondents to parcel out points among the Office 365 bits and pieces. "To determine which components were most valued, we used a point allocation question that forced exactly 100 points to be spread across the components based on their value to the organization," Roth's report read. The result: A cliff dive after the top two of Exchange-Outlook and Office ProPlus. Email took top honors on the value chart, collecting an average of 33 of the 100 points, with Office next with 29. From there, it was only lackluster results. SharePoint, for example, which had scored 74% on the usage poll, received only 14 points on the value evaluation. The disparity between usage and value for OneDrive for Business was even larger; 79% on usage, 12 points on value. Clearly, not all Office 365 parts are equal. "OneDrive for Business in particular stands out as frequently used but not as highly valued," Roth said in the report, adding that the high usage rate might stem from the fact that it's set as the default storage choice for Office. "But [that] doesn't guarantee full engagement with the product in other contexts." Teams, Roth continued, is a component worth watching because it scored well - 49% on usage - even though it had been available for just eight months at the time the survey was conducted. However, Teams' value - just four points - was near the bottom of the list. That should change, as Microsoft executes its plan to fold Skype for Business (which had a value of 12 in Gartner's poll) into Teams. "[This year] will be a test of whether users can unlock the value in Teams," Roth said. Values skewing toward the duopoly of email and Office apps didn't surprise Roth. Many enterprises simply aren't set up to tap the value of Office 365's other components, which are oriented toward "working in a collaborative, mobile and analytical fashion," as Roth put it. Or if they are ready and willing to work in such ways, they may not be able to. "It's often painful," he said of the effort to transform the way of doing things. "Even if you find individuals who would like to work that way, in teams, as a whole the company may not be ready to." Enterprises realize that they're not getting all they can from Office 365, even if they don't know how to quantify what they're missing. Judging value is notoriously difficult, Roth argued. "To some degree, they never knew how much value they got out of these tools in the first place," he said, referring to on-premises precursors - those that existed - to Office 365. "[Enterprises] know that lots of people are using it," Roth said of Office 365. "They can see that everyone is touching a part of it multiple times per week, even if they're not voluntarily using it." Yet usage won't soon turn into value for the components other than the big two, Roth maintained. "Companies have to find a new way of working," he stressed. "They have to work more in teams, not store documents on [local] hard drives, and work from anywhere. That's when you start seeing the value of Office 365." 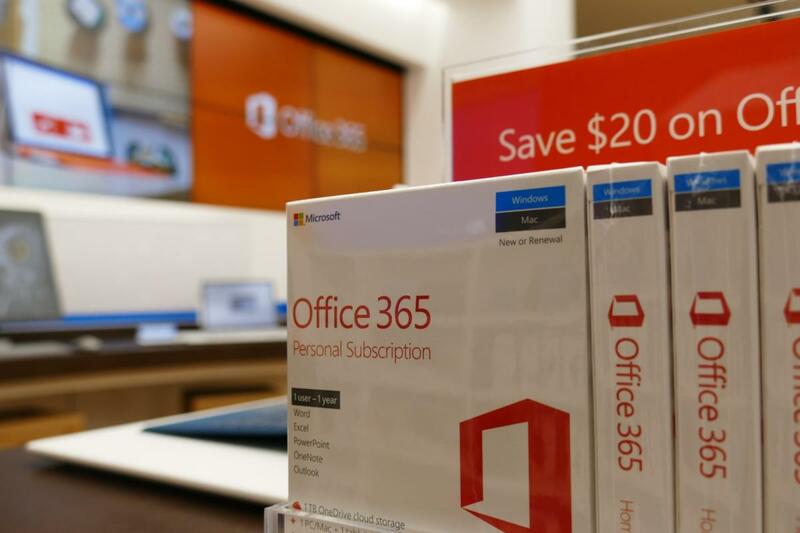 Microsoft might be leading customers toward a more collaborative, team-oriented and cloud-centric future, but a lot of Office 365 gets left on the table, value-wise, when a company declines - or outright refuses - to align with the software maker's vision. That's why Microsoft is working to shove customers into its future. "Microsoft is making a very heavy push, trying to make sure [people are] using more and more of Office 365's components, and using them more often," said Roth. IT professionals parceled out 100 points among the many Office 365 components to indicate the value each provides their organization. The results were only surprising in how little most valued so much of the subscription's offerings. This story, "Office 365: Enterprise usage doesn't translate into enterprise value" was originally published by Computerworld.